Ralph F. McHenry was born in Frostburg, Jefferson County, Pennsylvania, on August 30, 1869, the son of George and Anna McHenry. Living in Jefferson County for sixteen years, McHenry received his early education in the Frostburg schools. Upon moving to Indiana County, he attended Pickering Run school and afterwards, taught for four years in the public schools. In 1892, he entered the Western Pennsylvania Medical College and in 1895, he graduated with his M.D. 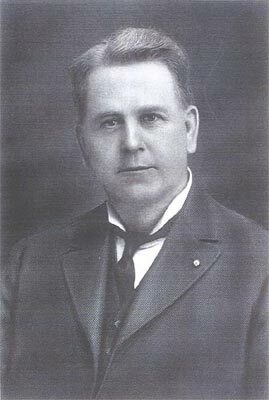 Upon graduation, McHenry bought the practice and property of Dr. William E. Dodson of Marion Center, Pennsylvania and worked there for ten years. In March 1905, he left his practice in Marion Center to become the chief physician and surgeon for John H. Weaver in Heilwood. He would remain in Heilwood until October 1914, at which time he resigned and shortly thereafter, became the resident physician at the hospital in nearby Windber, Pennsylvania. In 1915, Dr. McHenry died at the age of 46 from typhoid fever.